The CNN headline today reads “Obama gets an ‘A’ for effort from Schwarzenegger“. I had a good laugh at this one. When Swarzenegger was running for Governator, I was of the opinion that he had a good environmental and fiscal platform and that he had a large multi-partisan base. I found myself at odds with others on the right who were voting for him because of his ‘character’, and because he was going to go in there and clean house, squeeze some pencil-neck bureaucrats, etc. Clearly, this wasn’t the case. Swarzenegger found out in short order that the legislature was dug in and had no obligation to do what he wished. He has turned out to be a slightly better than average governor on the sense that he has done little harm; done little of anything in fact. It’s not for lack of trying, but the way our government is set up. One branch of government can do very little without the cooperation of at least one other branch. I had higher hopes for Obama. He went into this with an extremely strong mandate and a knack for finding common ground between opposing groups. Thus far, his failings have been the opposite of those of the Governator; he has been too trusting and willing to compromise. He has passed some of the most massive legislations in history, but only after all that is good in them has been sucked out and replaced with corporate welfare, and done so by his own supposed allies. I found the above headline funny because I get the feeling both of them are looking at each other and saying, “wow, this isn’t as easy as it looks”. A few weeks back when Obama had yet to publicly pick a nominee for the Supreme court, CNN put up a picture on their front page of a large grid of faces, each a likely choice for the nomination. In a fraction of a second, before I even recognized any of their identities, I picked Sotomayor as the obvious political choice. I find this troubling. It’s true that she could be the best of the bunch, but I think that is improbable for reasons I’ll go into below. Pat Buchanan has repeatedly referred to Sotomayor as an affirmative action pick. While I can see how he would think that, I think it is more complicated than that. Obama got two thirds of the Hispanic vote, and 56% of women. He might be trying to directly appeal to his base. As much as it may have been one of his greatest obstacles at many points on the path, I’m of the belief that Obama’s ethnicity was a positive for him in the final presidential vote. He could arguably claim that he has a mandate to shake up the old white guy club that is Washington D.C.
Obama has both the Constitutional background and the advisers to tell him the history and expectations connected with a Supreme Court nomination. There has been something of a tradition of ‘reserved seats’ on the courts for various groups, such as Catholics (Catholics now make up two thirds of the court). I don’t like such traditions. I think the appointment should go to the most qualified individual, based on impartiality, and an understanding of the Constitution and our legal system. I don’t think we should legislate this, but I do think a strong legal background is a plus. I think as much as possible, the government should be blind to race, gender, and religion. The above quote doesn’t come from anyone I’d confirm for for such a position. I’ve yet to hear anyone say that they think a white guy making the inverse statement would have any chance of confirmation. I’ve heard the Obama administration’s statement that if Sotomayor were to make the statement again she would have used different wording. This wasn’t some offhand comment she made after a few drinks. This was in a published speech for a law review, specifically Law Raza Law Review, a play on La Raza, or ‘the race’, a term of Hispanic pride. She is a member of The National Council of La Raza, a group dedicated to the advancement of Hispanics. She has used the above quote in many speeches and many places over a nine year period. It was poorly stated and not what she meant, in which case she is unqualified for a position in which all of her statements will be picked over for decades or centuries to come by lawyers and judges deciding people’s futures. She said it because she was pandering to Law Raza, in which case she doesn’t have the ethics for the job. She believes what she said, in which case she is guilty of ethnic discrimination, and doesn’t have the impartiality to be any kind of judge, much less on the Supreme Court. The reason Barack gave for voting against Roberts was the he had the impression that Roberts most often ruled for the strong over the weak. This is a statement that brings me to the core of my beliefs about affirmative action. If Hispanics tend to be poor, should we give Hispanics some help? No. If you want to help the poor, help the poor, not the Hispanic. To do otherwise isn’t fair to the poor who aren’t singled out by their ethnicity, or to those Hispanics who are already successful, and it breeds resentment and the impression that people gained their positions through something other than their own merit. If Sotomayor is confirmed without addressing that quote, all of her decisions on discrimination cases will come with an asterisk. 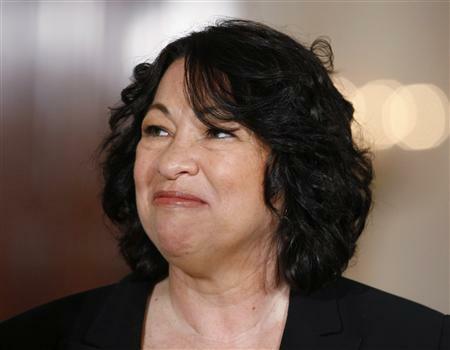 As for her past work, Sotomayor has twice ruled on Second Amendment cases as if it did not exist. I’ll be interested to hear what she has to say for herself in the confirmation hearings. The Democrats have control and it is expected Sotomayor will be confirmed. The Republicans don’t have the cojones to vote against a swing demographic, but who knows, it could yet get ugly enough to be contested. Update: Pat Buchanan has an interesting post up referencing Sonia Sotomayor’s statements on affirmative action and how it affected her carreer.